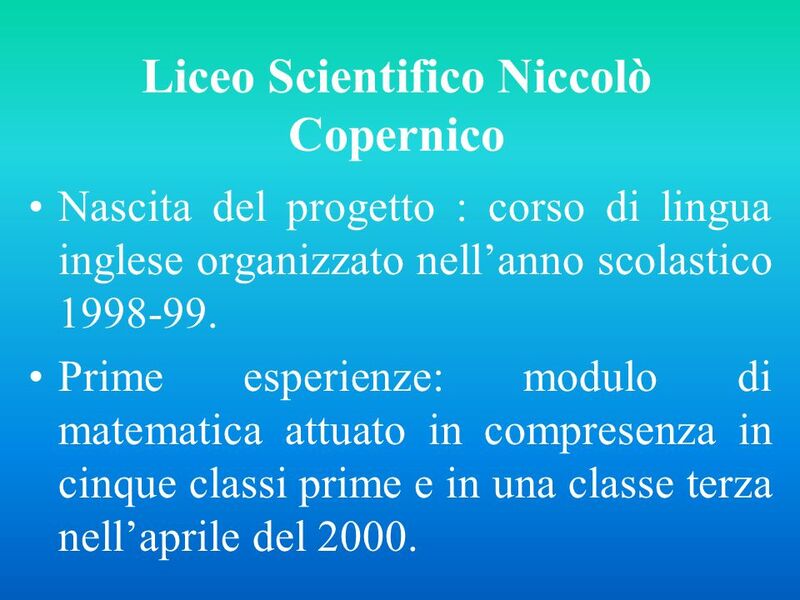 Nascita del progetto : corso di lingua inglese organizzato nell’anno scolastico Prime esperienze: modulo di matematica attuato in compresenza in cinque classi prime e in una classe terza nell’aprile del 2000. 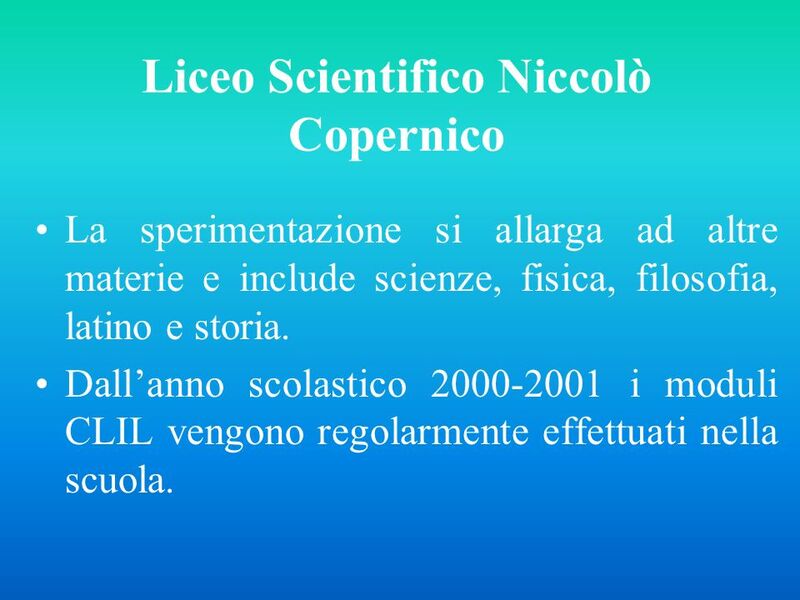 La sperimentazione si allarga ad altre materie e include scienze, fisica, filosofia, latino e storia. 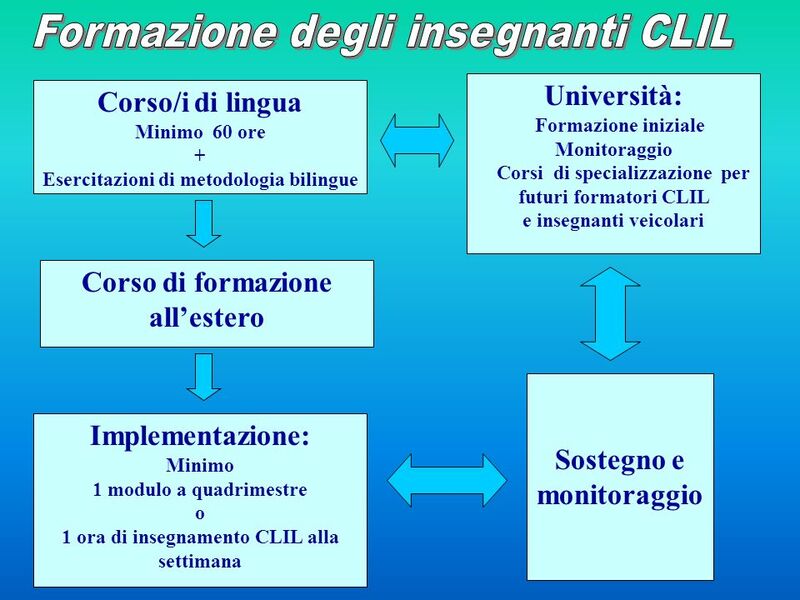 Dall’anno scolastico i moduli CLIL vengono regolarmente effettuati nella scuola. 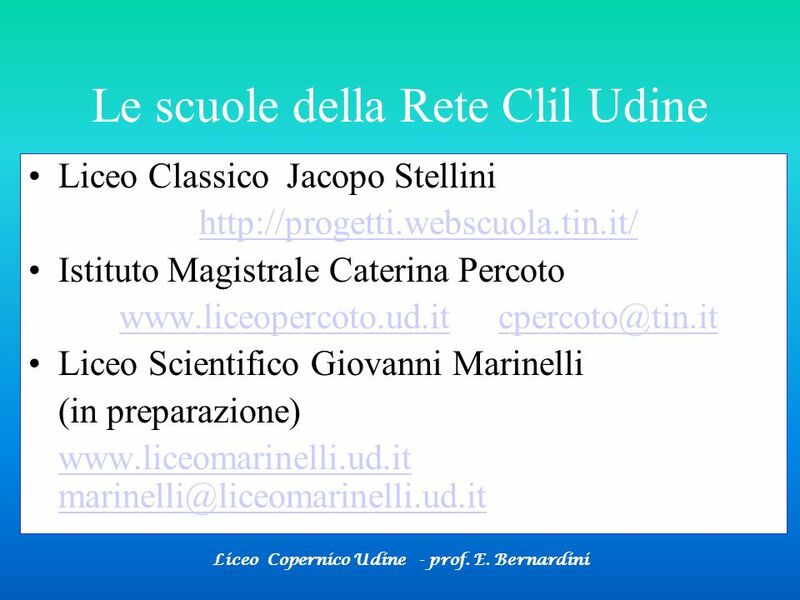 Definizione degli obiettivi della scuola, da cui dipenderanno le scelte metodologiche. 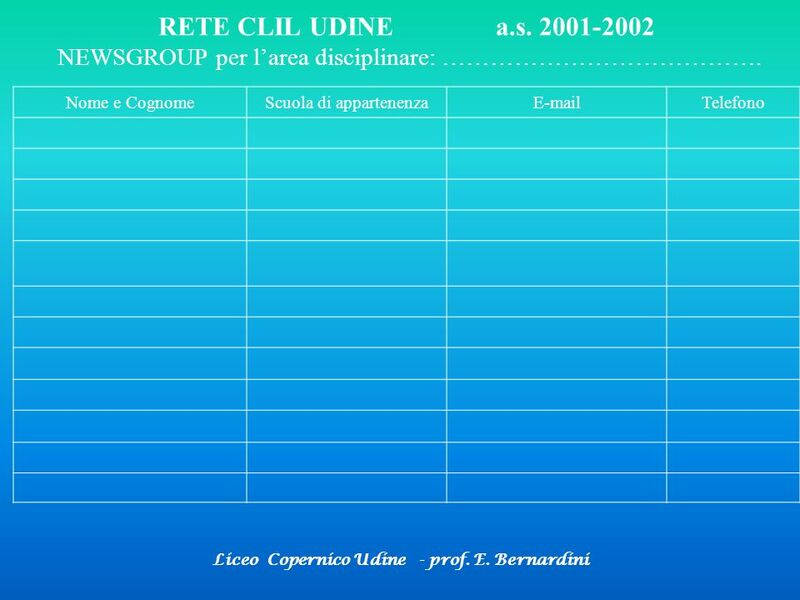 Sostegno della dirigenza e dello staff dirigenziale e amministrativo. 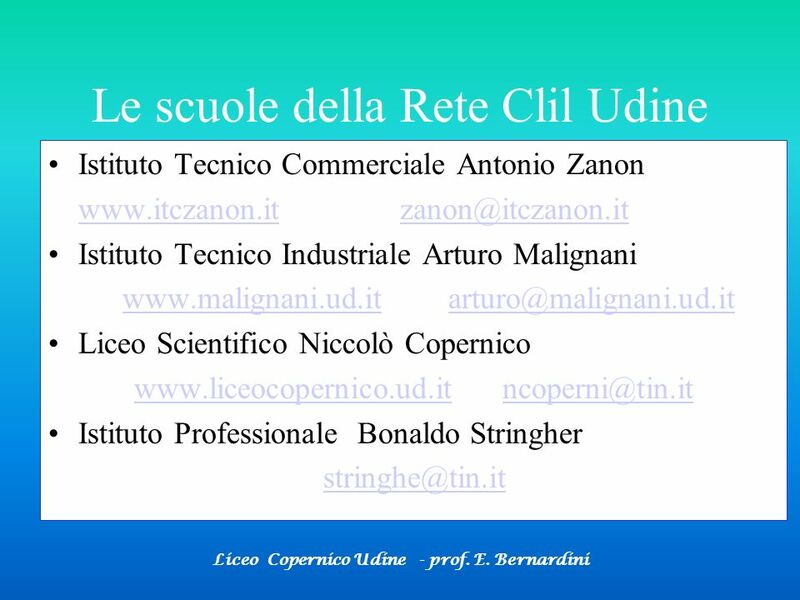 Autorizzazione del Collegio Docenti. 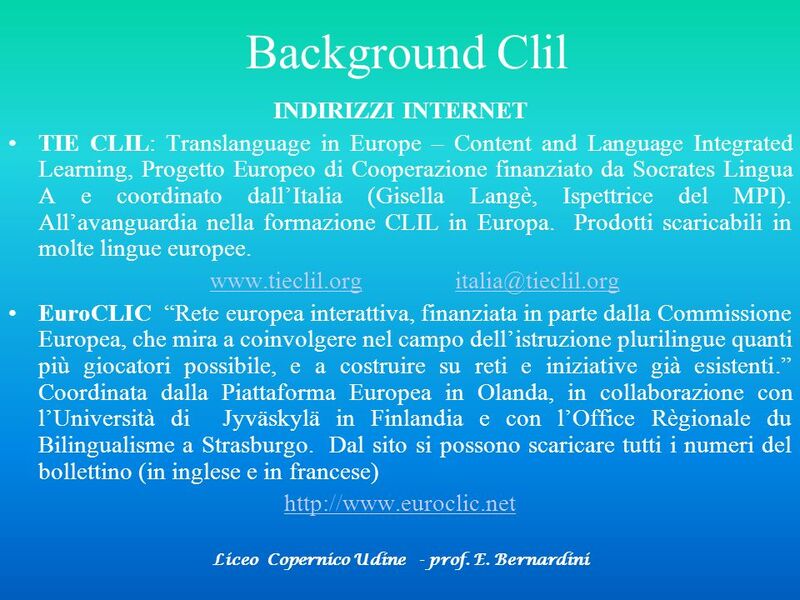 Sostegno del Dipartimento di Lingue Straniere. 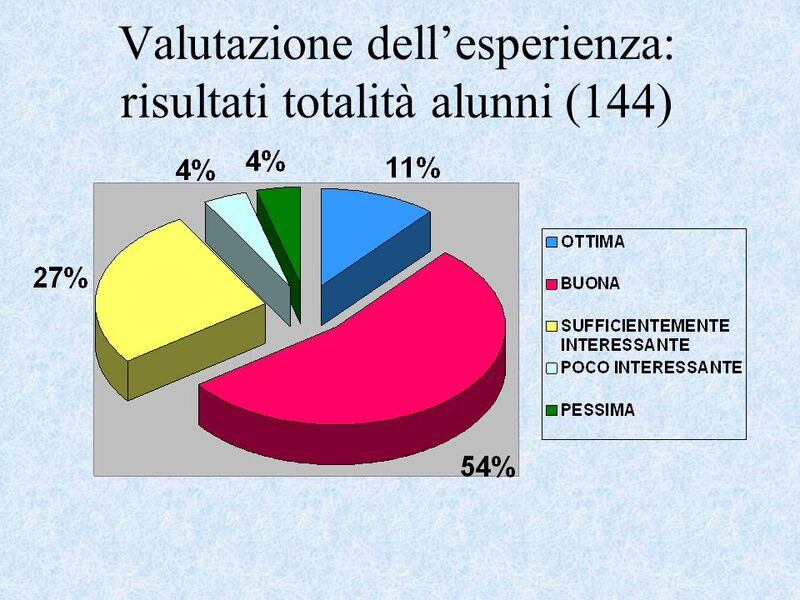 Consenso informato degli interessati – tramite consigli di classi aperti a tutti i genitori e a tutti gli studenti. 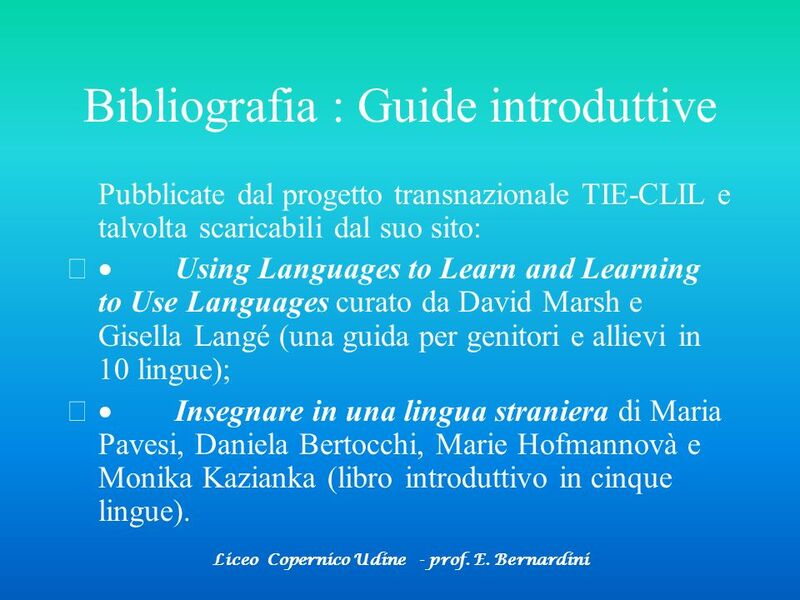 9 Formatori I formatori CLIL si identificano generalmente negli insegnanti di lingue straniere. 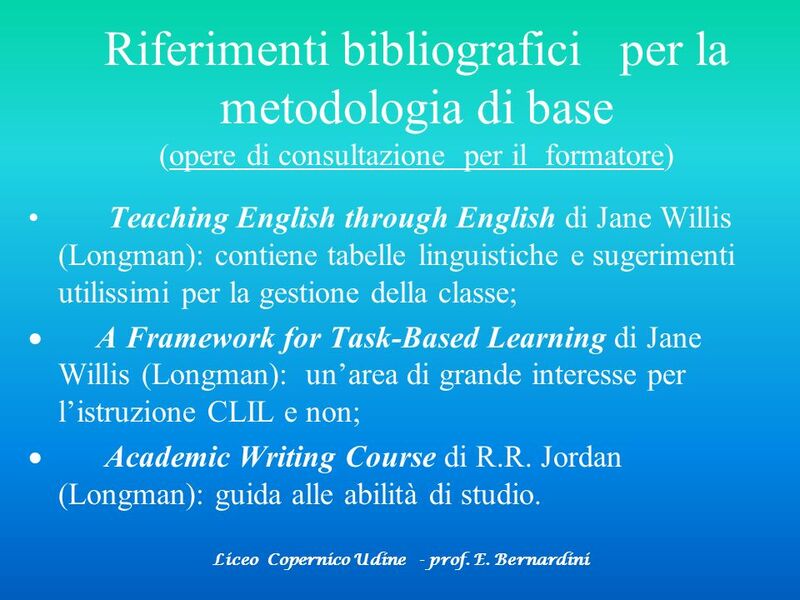 La preparazione dei docenti veicolari non può comunque limitarsi alla preparazione linguistica, ma deve tener conto dei presupposti teorici e metodologici essenziali, che si possono ormai facilmente reperire su Internet, nella bibliografia specializzata oppure attraverso una formazione specifica in materia, come quella fornita dall’università o da enti preposti alla ricerca. 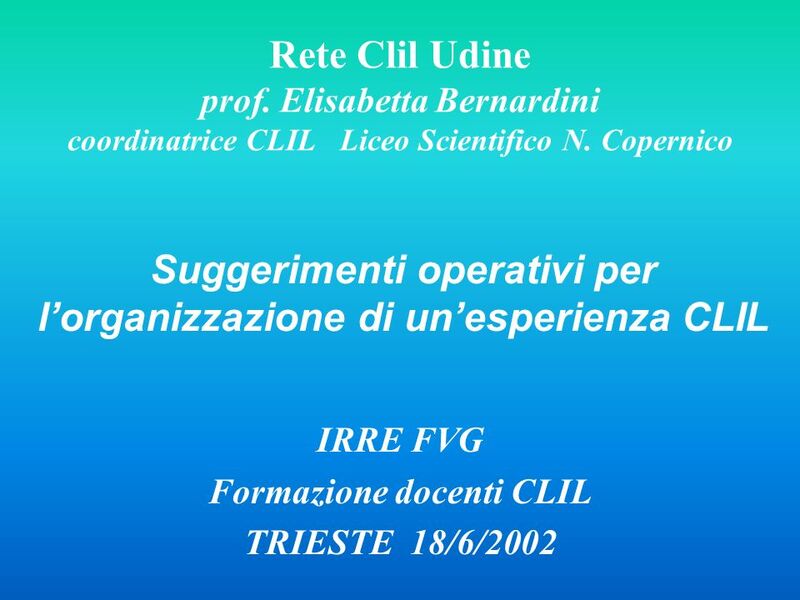 Livello di ingresso. B2? 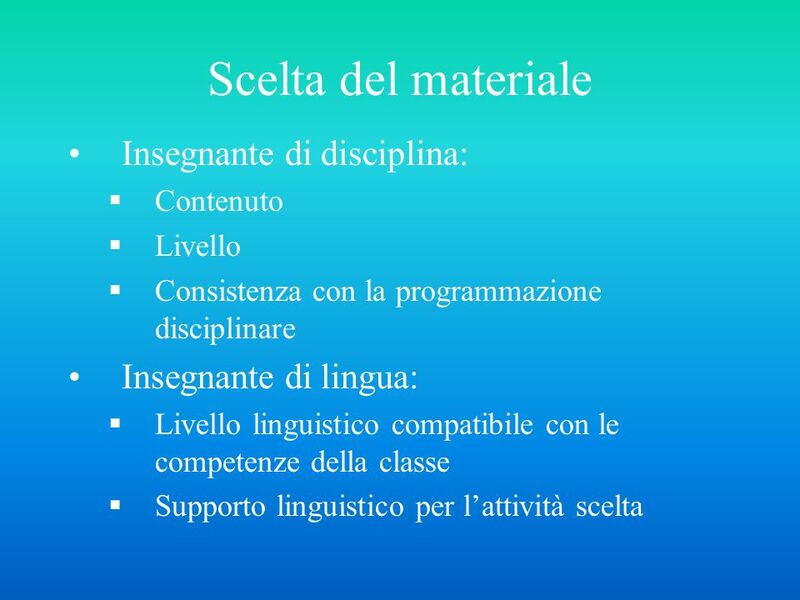 Revisione linguistica. 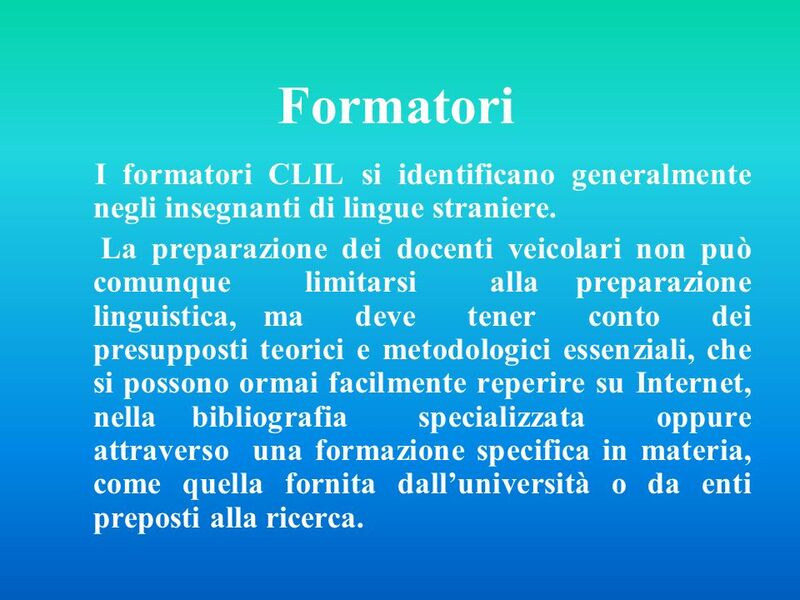 Abilità comunicative – speciale attenzione alla comprensione e alla comunicazione orali. 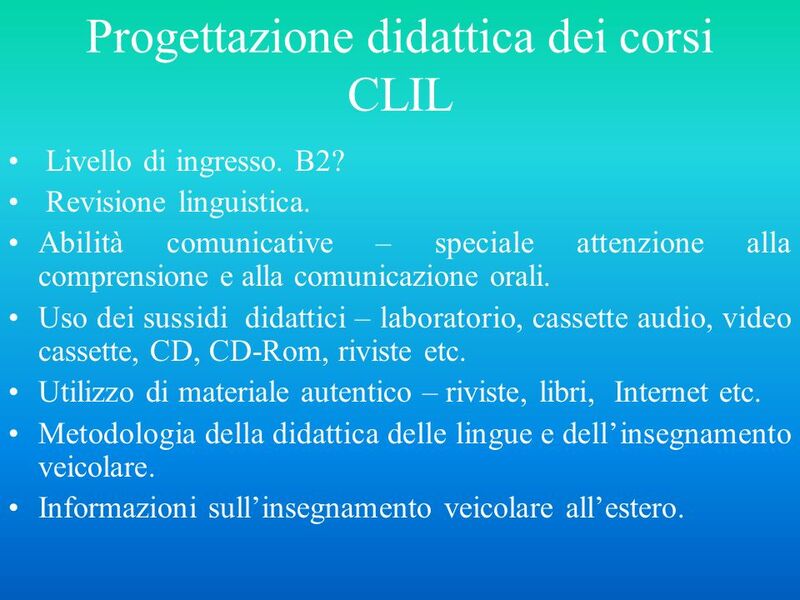 Uso dei sussidi didattici – laboratorio, cassette audio, video cassette, CD, CD-Rom, riviste etc. 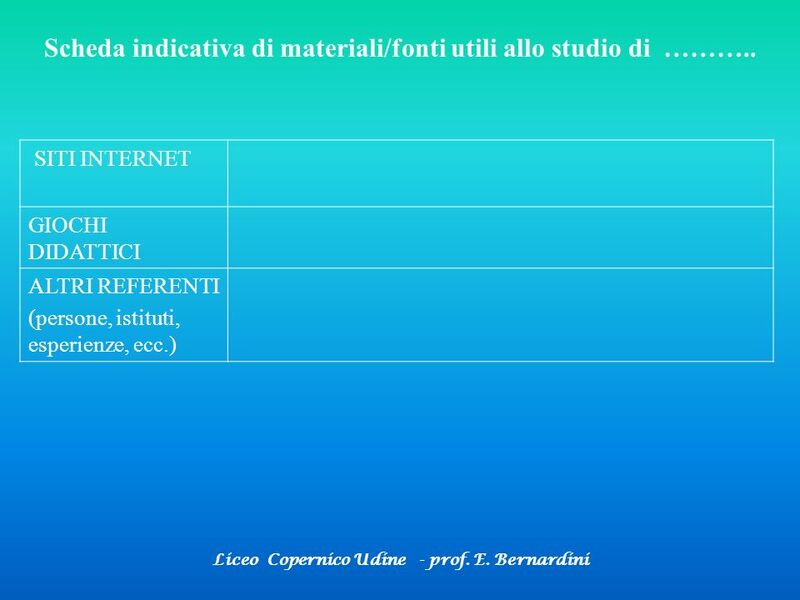 Utilizzo di materiale autentico – riviste, libri, Internet etc. 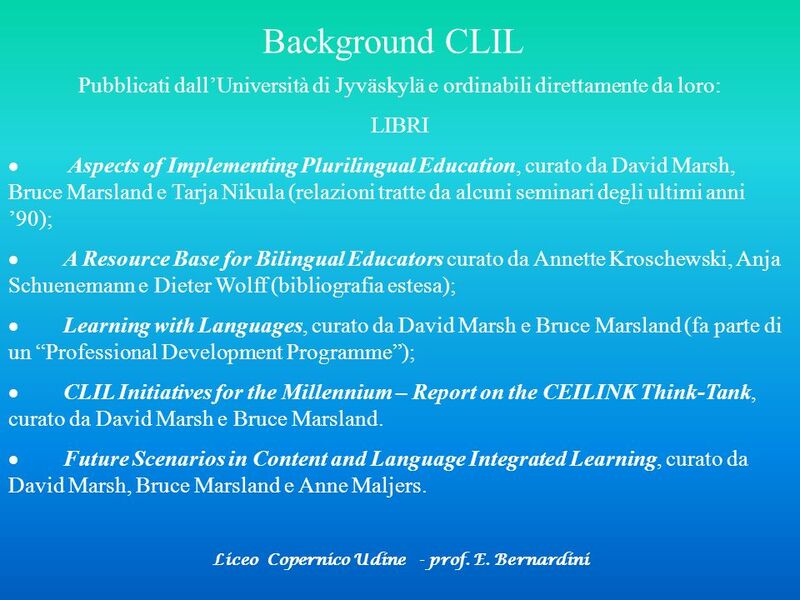 Metodologia della didattica delle lingue e dell’insegnamento veicolare. 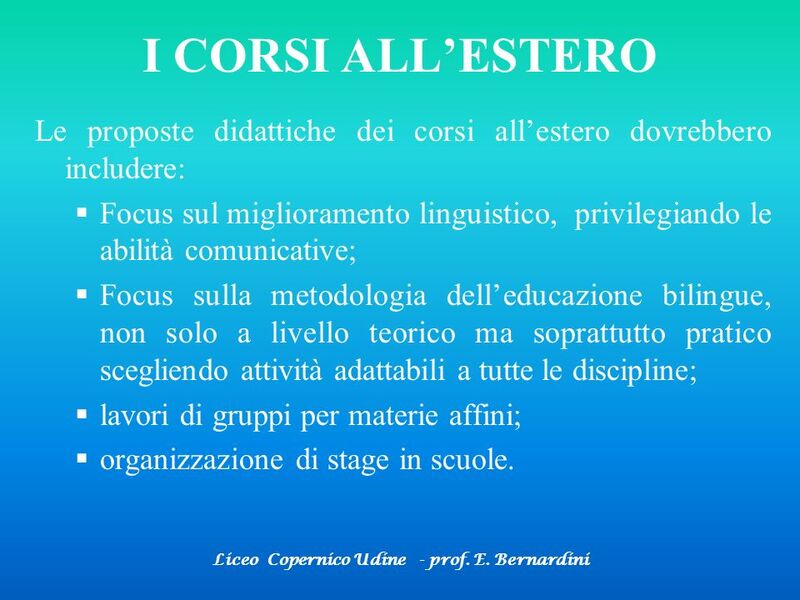 Informazioni sull’insegnamento veicolare all’estero. 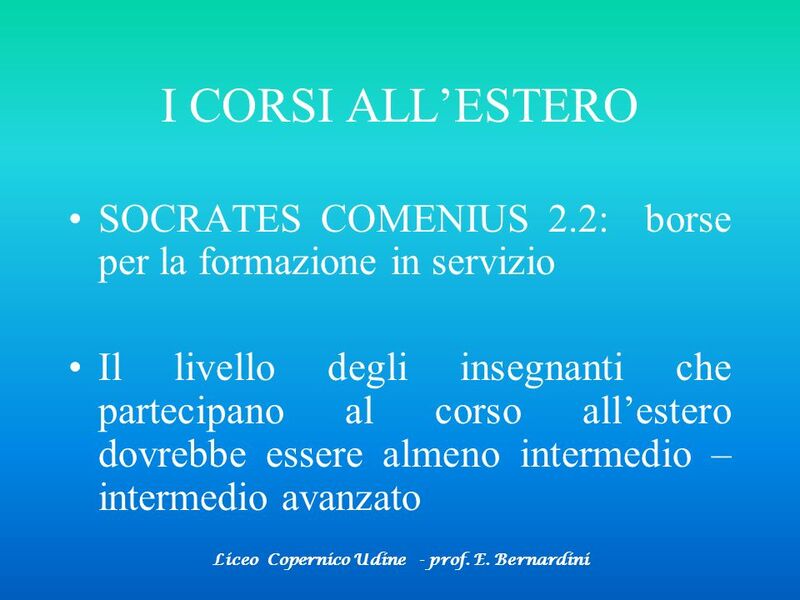 21 Fase operativa Incentivazione economica. 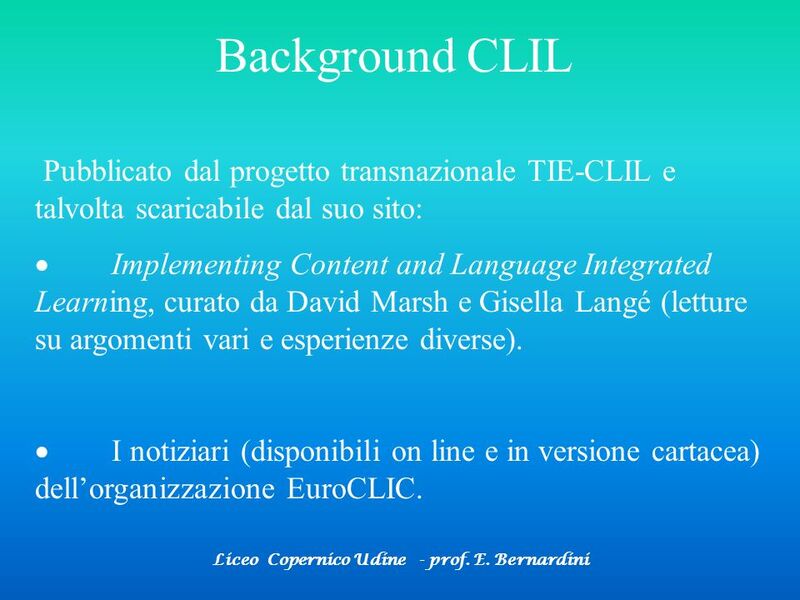 Sostegno al lavoro dei docenti veicolari: Corso CLIL Compresenza Sessioni per materie affini Materiale Valutazione Questionari per la valutazione dell’esperienza. 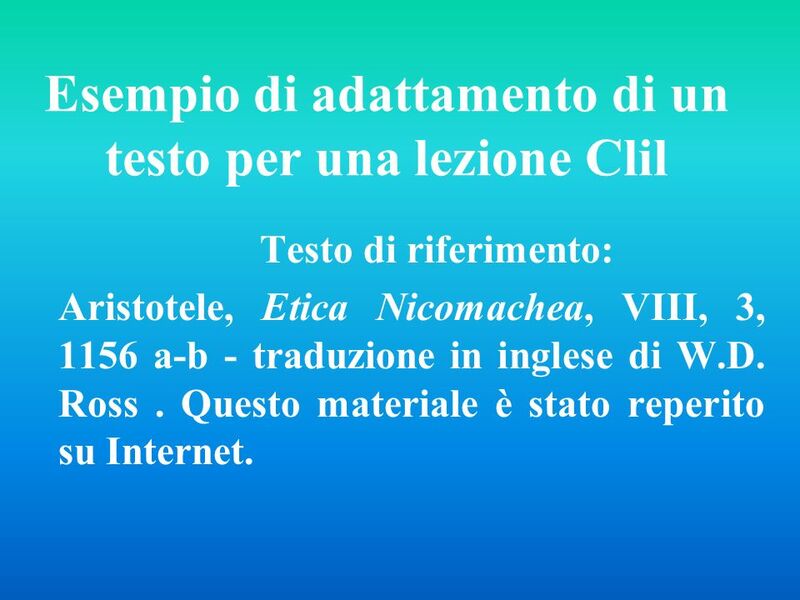 23 Scheda indicativa di materiali/fonti utili allo studio di ………..
Testo di riferimento: Aristotele, Etica Nicomachea, VIII, 3, 1156 a-b - traduzione in inglese di W.D. Ross . 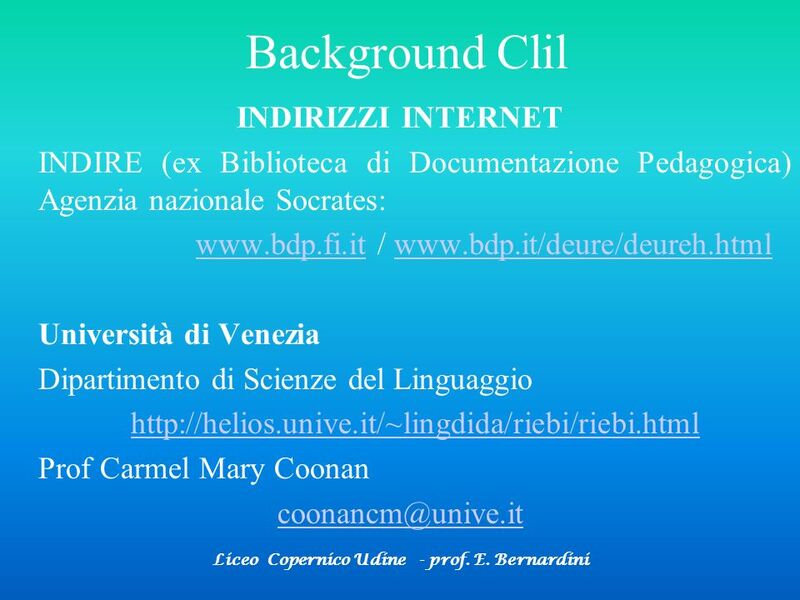 Questo materiale è stato reperito su Internet. 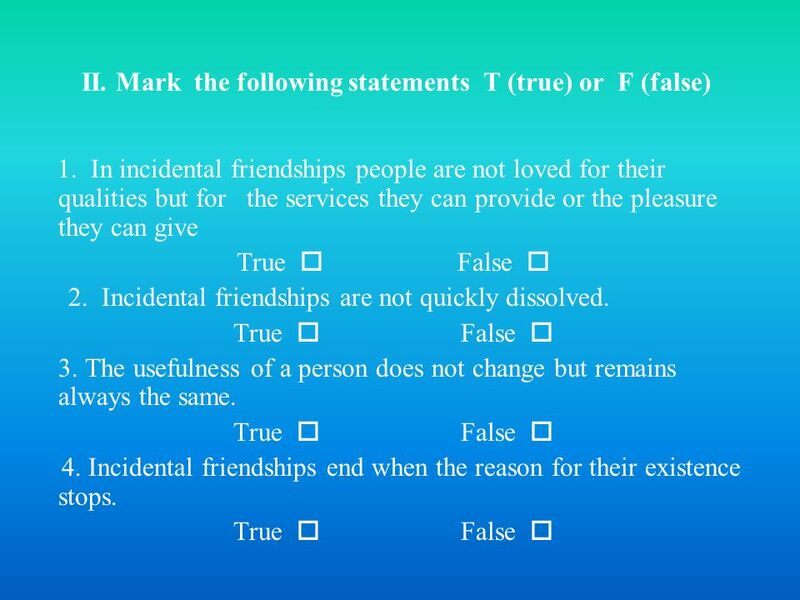 And thus these friendships are only incidental; for it is not as being the man he is that the loved person is loved, but as providing some good or pleasure. Such friendships, then, are easily dissolved, if the parties do not remain like themselves; for if the one party is no longer pleasant or useful the other ceases to love him.Now the useful is not permanent but is always changing. Thus when the motive of the friendship is done away, the friendship is dissolved, inasmuch as it existed only for the ends in question. This kind of friendship seems to exist chiefly between old people (for at that age people pursue not the pleasant but the useful) and, of those who are in their prime or young, between those who pursue utility. And such people do not live much with each other either; for sometimes they do not even find each other pleasant; therefore they do not need such companionship unless they are useful to each other; for they are pleasant to each other only in so far as they rouse in each other hopes of something good to come.On the other hand the friendship of young people seems to aim at pleasure; for they live under the guidance of emotion, and pursue above all what is pleasant to themselves and what is immediately before them; but with increasing age their pleasures become different. This is why they quickly become friends and quickly cease to be so; their friendship changes with the object that is found pleasant, and such pleasure alters quickly. Young people are amorous too; for the greater part of the friendship of love depends on emotion and aims at pleasure; this is why they fall in love and quickly fall out of love, changing often within a single day. But these people do wish to spend their days and lives together; for it is thus that they attain the purpose of their friendship. 29 And thus1 these friendships are only incidental2; for it is not as being the man he is that the loved person is loved, but as providing some good or pleasure. Such friendships, then, are easily dissolved3, if the parties4 do not remain like themselves; for if the one party is no longer pleasant or useful the other ceases5 to love him. 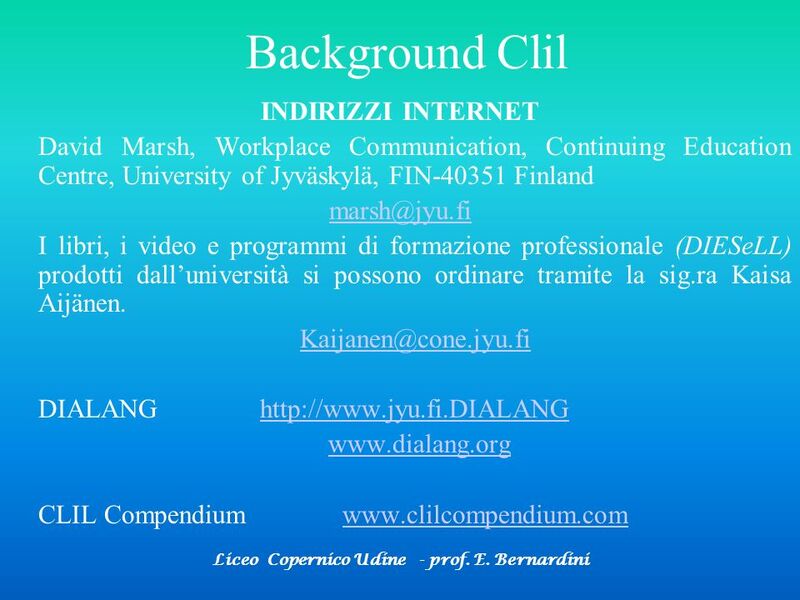 Now the useful is not permanent but is always changing. Thus when the motive of the friendship is done away, the friendship is dissolved, inasmuch6 as it existed only for the ends in question. This kind of friendship seems to exist chiefly7 between old people (for at that age people pursue not the pleasant but the useful) and, of those who are in their prime8 or young, between those who pursue9 utility. And such people do not live much with each other either; for sometimes they do not even find each other pleasant; therefore they do not need such companionship10 unless they are useful to each other; for11 they are pleasant to each other only in so far12 as they rouse13 in each other hopes of something good to come. On the other hand the friendship of young people seems to aim14 at pleasure; for they live under the guidance15 of emotion, and pursue above all what is pleasant to themselves and what is immediately before them; but with increasing age16 their pleasures become different. This is why they quickly become friends and quickly cease to be so; their friendship changes with the object that is found pleasant, and such pleasure alters17quickly. Young people are amorous too; for the greater part of the friendship of love depends on emotion and aims at pleasure; this is why they fall in love and quickly fall out of love, changing often within a single day. But these people do wish to spend their days and lives together; for it is thus that they attain18 the purpose19 of their friendship. And thus1 these friendships are only incidental2; for it is not as being the man he is that the loved person is loved, but as providing some good or pleasure. Such friendships, then, are easily dissolved3, if the parties4 do not remain like themselves; for if the one party is no longer pleasant or useful the other ceases5 to love him. Now the useful is not permanent but is always changing. Thus when the motive of the friendship is done away, the friendship is dissolved, inasmuch6 as it existed only for the ends in question. This kind of friendship seems to exist chiefly7 between old people (for at that age people pursue not the pleasant but the useful) and, of those who are in their prime8 or young, between those who pursue9 utility. And such people do not live much with each other either; for sometimes they do not even find each other pleasant; therefore they do not need such companionship10 unless they are useful to each other; for11 they are pleasant to each other only in so far12 as they rouse13 in each other hopes of something good to come. 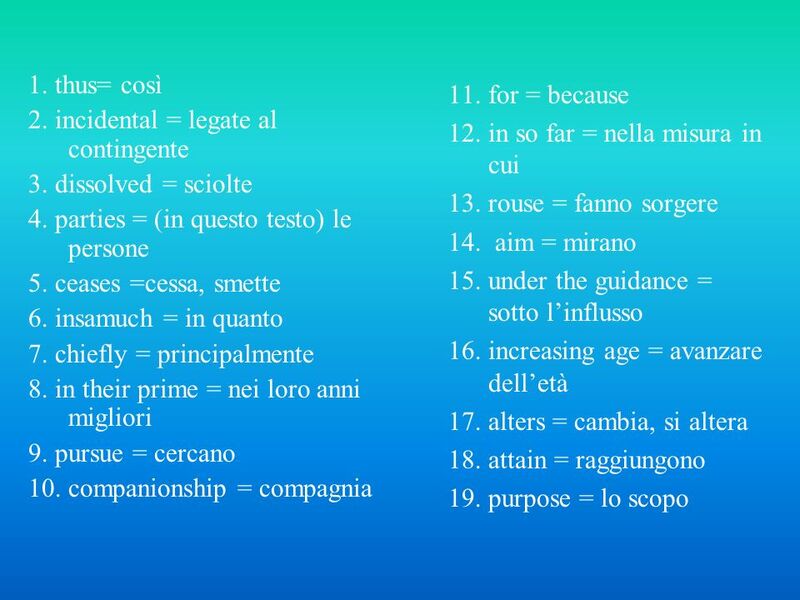 On the other hand the friendship of young people seems to aim14 at pleasure; for they live under the guidance15 of emotion, and pursue above all what is pleasant to themselves and what is immediately before them; but with increasing age16 their pleasures become different. This is why they quickly become friends and quickly cease to be so; their friendship changes with the object that is found pleasant, and such pleasure alters17quickly. Young people are amorous too; for the greater part of the friendship of love depends on emotion and aims at pleasure; this is why they fall in love and quickly fall out of love, changing often within a single day. But these people do wish to spend their days and lives together; for it is thus that they attain18 the purpose19 of their friendship. 1. In incidental friendships people are not loved for their qualities but for the services they can provide or the pleasure they can give True  False  2. Incidental friendships are not quickly dissolved. True  False  3. The usefulness of a person does not change but remains always the same. 4. Incidental friendships end when the reason for their existence stops. 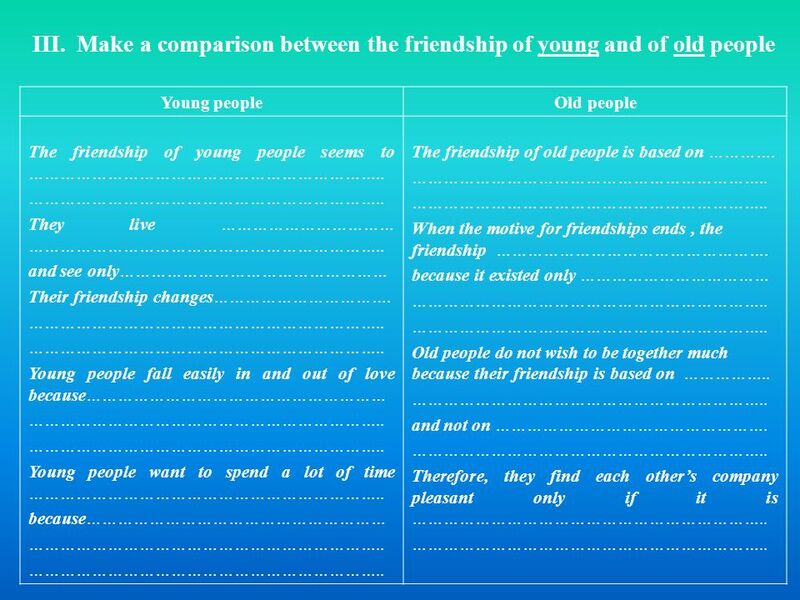 Young people Old people The friendship of young people seems to ………………………………………………………….. ………………………………………………………….. They live …………………………… ………………………………………………………….. and see only…………………………………………… Their friendship changes……………………………. Young people fall easily in and out of love because………………………………………………… Young people want to spend a lot of time ………………………………………………………….. because………………………………………………… The friendship of old people is based on …………. When the motive for friendships ends , the friendship ……………………………………………. because it existed only ……………………………… Old people do not wish to be together much because their friendship is based on …………….. and not on ……………………………………………. 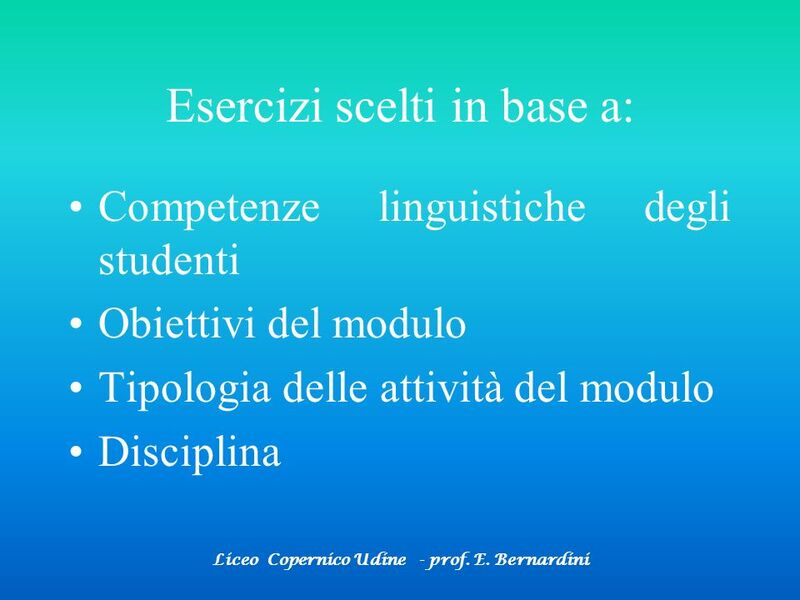 Therefore, they find each other’s company pleasant only if it is …………………………………………………………..
Scaricare ppt "Suggerimenti operativi per l’organizzazione di un’esperienza CLIL"
Nellambito del progetto integrato sulladolescenza, durante le ore di inglese, abbiamo partecipato ad alcuni incontri con un insegnante madrelingua. In. Enzo Anselmo Ferrari By Giovanni Amicucci. Di Enzo Questo è Enzo Anselmo Ferrari. Enzo compleanno è diciotto febbraio 1898. Enzo muore è quattordici agosto.